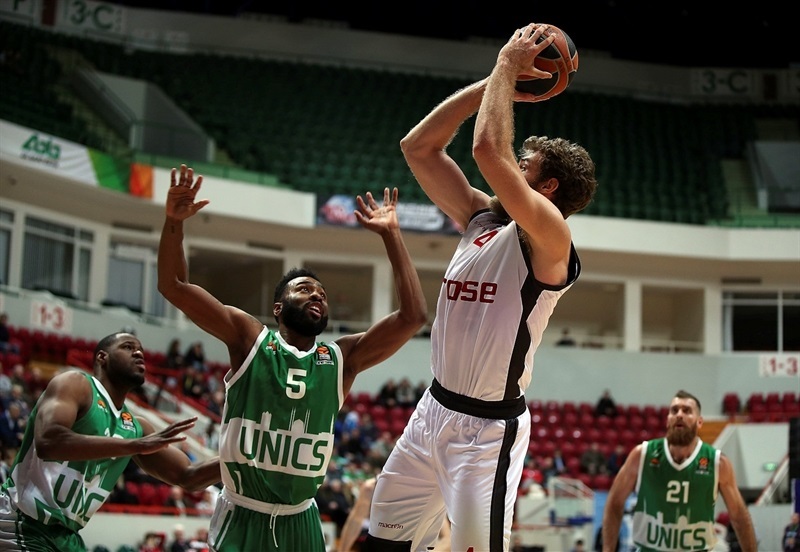 Unics Kazan rallied from a 12-point deficit in the final 15 minutes to beat Brose Bamberg 63-58 at home on Thursday in Round 17. 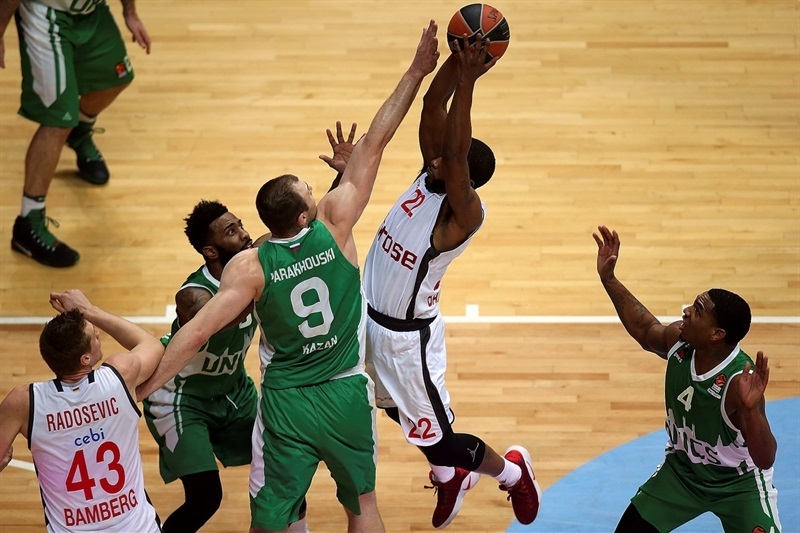 Both teams now have a 7-10 records in the Turkish Airlines EuroLeague Regular Season. 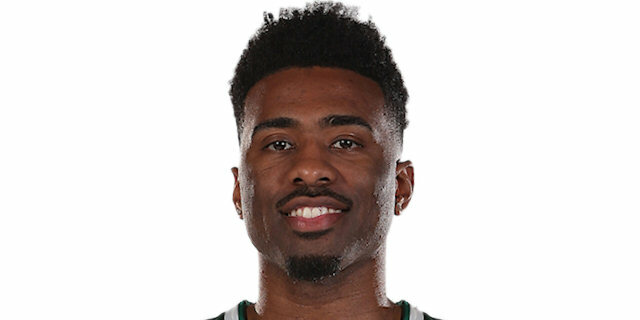 Keith Langford led the winners with 27 points, hitting 7 of 17 two-point shots, 3 of 7 triples and 4 of 6 free throws. His 24 field goal attempts were the most by a EuroLeague player this season, while his 10 rebounds and 5 assists also led his team, which played without starter Quino Colom. 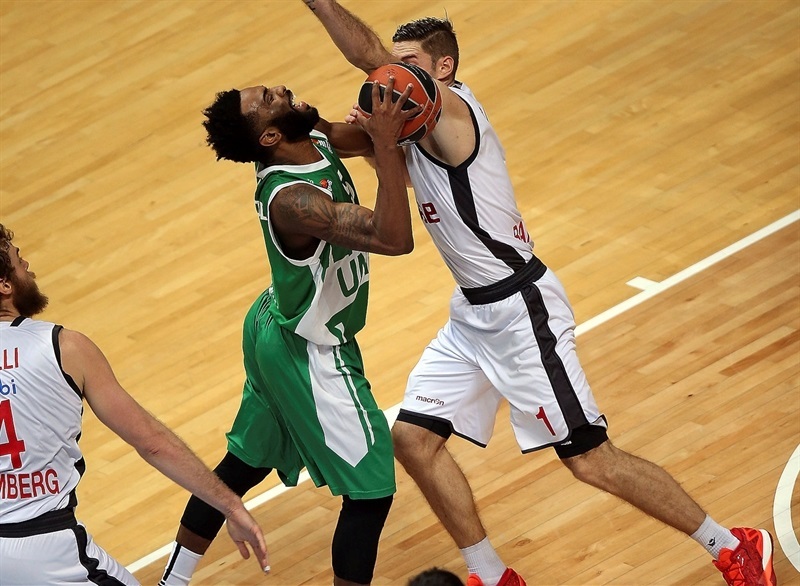 Latavious Williams added 13 on 6-of-9 two-point shots for Unics. Janis Strelnieks led Bamberg with 13 points, 7 rebounds and 6 assists. Darius Miller added 12 points for the guests. 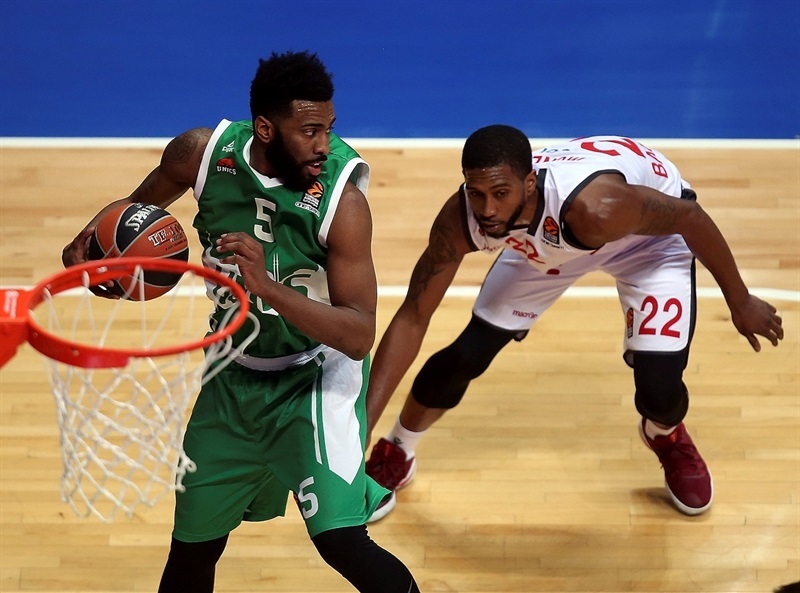 Bamberg struggled from three-point range (2-of-13, 15.4%) in the first half, but excelled inside the arc (13-of-21, 61.9%), collected 5 steals and only allowed Unics just 2 offensive rebounds to get a 30-36 edge at the break. 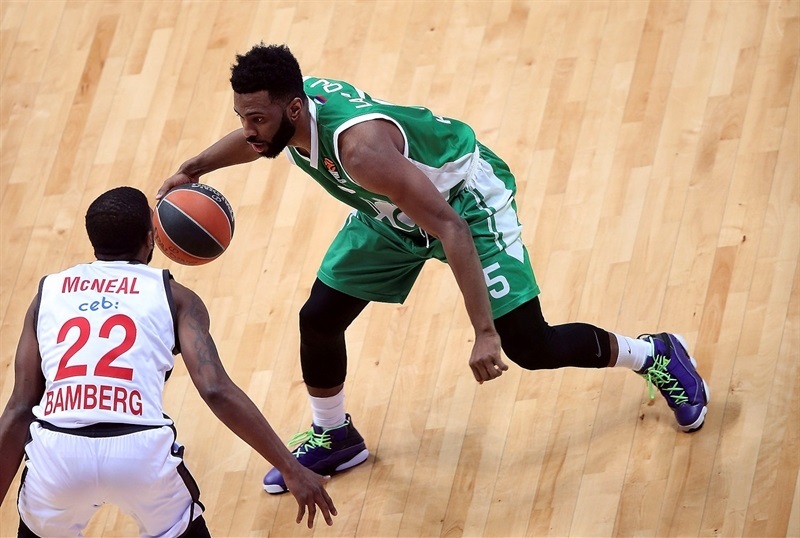 The Unics defense regrouped, however, and limited Bamberg to just 22 second-half points, as the guests finished the game with 14 turnovers and 4-of-25 three-point shooting (16%). 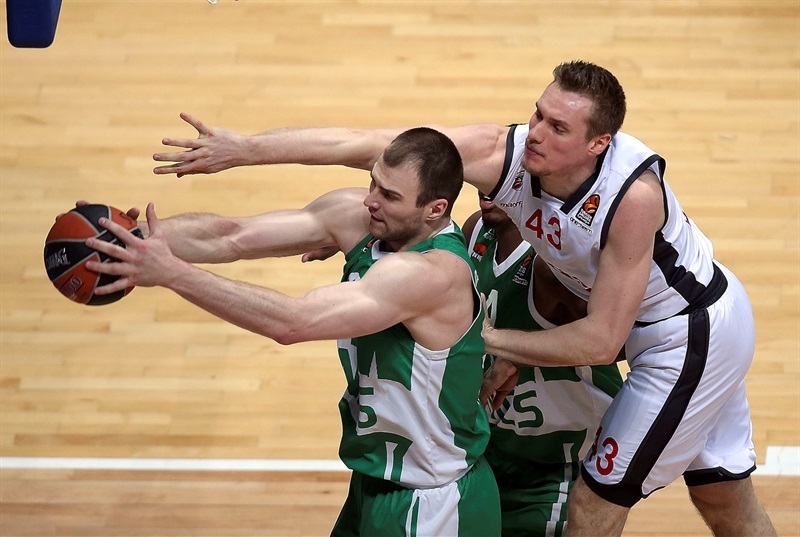 Unics pulled down a season-high 31 defensive rebounds, just 2 away from its own EuroLeague club record. Nikos Zisis got Bamberg going with a running jumper and Vladimir Veremeenko added a layup for a 0-4 lead. Paul Stoll stepped up with a steal and layup before Langford followed a turnaround jumper with a great assist to Williams, whose dunk made the guests call timeout at 8-5. 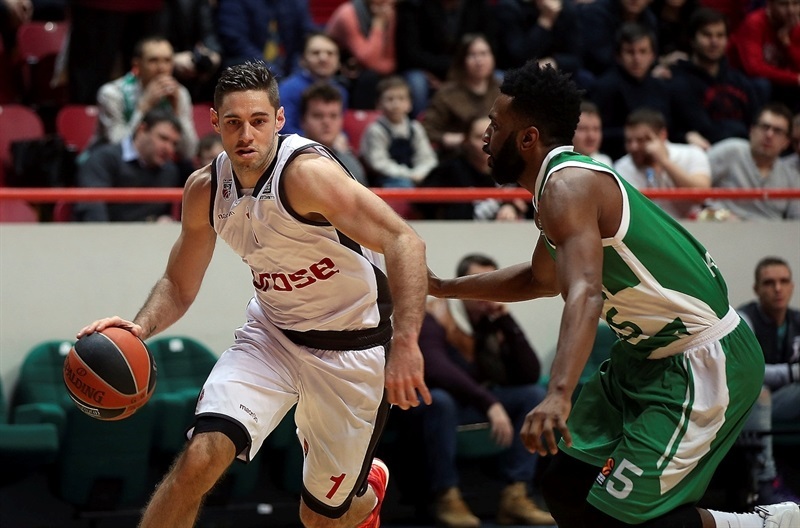 Miller followed a three-point play with a driving layup, Nicolo Melli added a put-back dunk and an outstanding Leon Radosevic boosted Bamberg's lead to 13-18. Free throws by Strelnieks fixed the score at 13-20 after 10 minutes. Daniel Theis took over with an alley-oop dunk, Jerel McNeal added a layup and a corner triple by Strelnieks made it a double-digit game, 16-27. 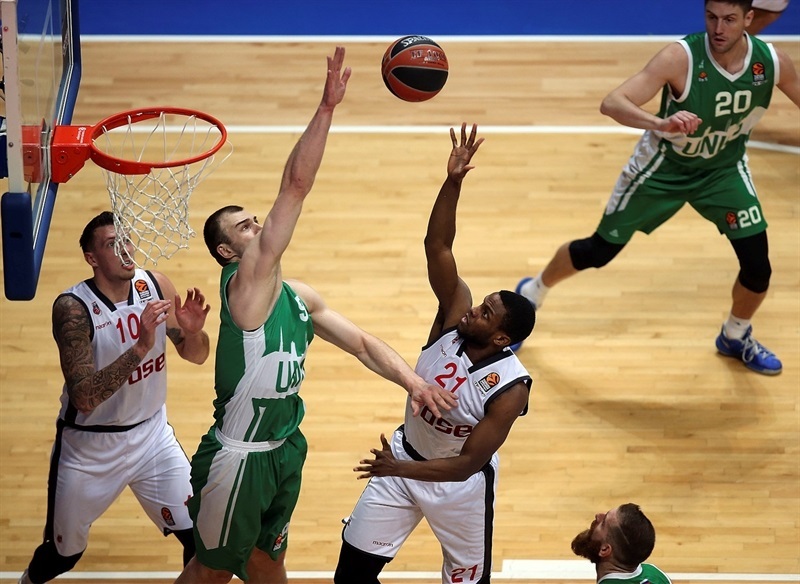 Langford kept pacing Unics with a couple of three-point plays and Art Parakhouski followed a put-back layup with a backdoor slam to bring Unics within 30-33. Miller nailed his first three-pointer to boost Bamberg's lead to 30-36 at halftime. 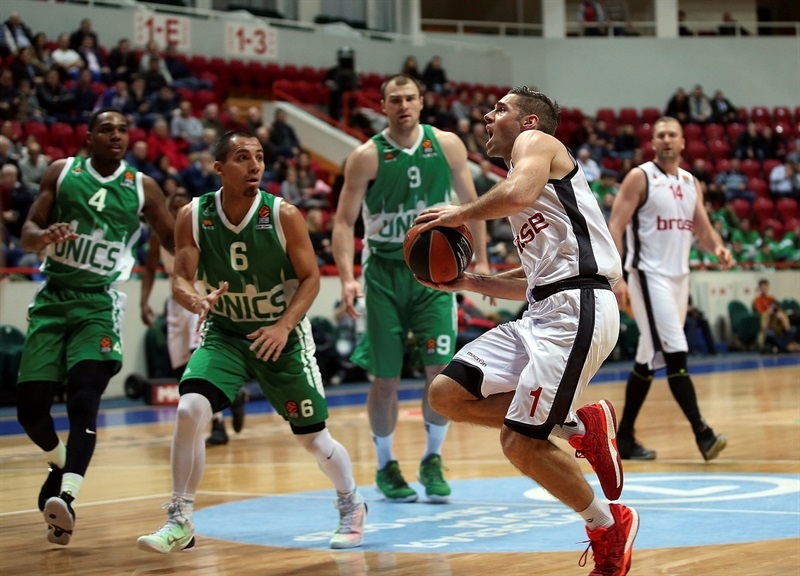 Unics went scoreless for more than 5 minutes after the break. Meanwhile, Strelnieks followed with a jumper off the dribble with a layup in a 0-6 run that meant a 30-42 Bamberg margin. 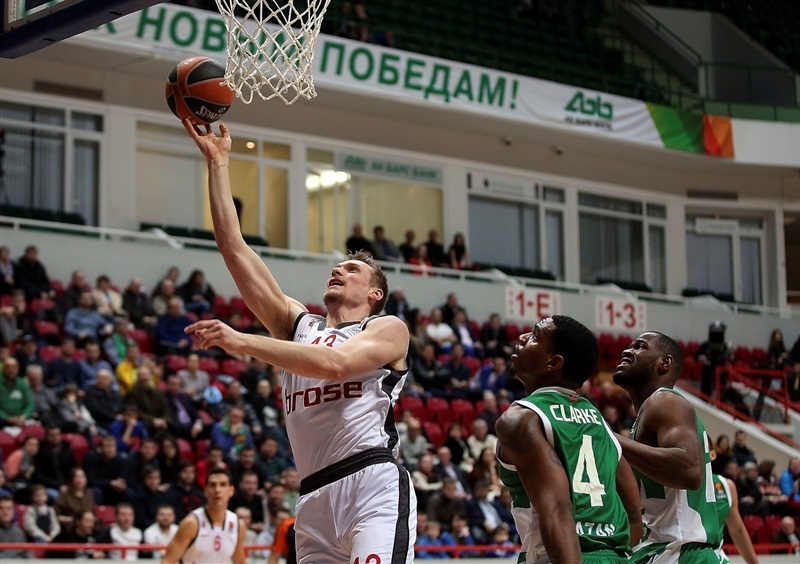 Pavel Antipov tried to change things with a wild three-point play and free throws that Williams followed with a huge dunk to bring Unics back to life at 38-42. Stoll and Langford struck from downtown to tie the game, 44-44, but Lucca Staiger joined the three-point shootout to make Bamberg regain a 46-47 edge after 30 minutes. Williams scored down low and Langford buried another three-pointer to tie it at 51-51 with over 7 minutes left. A jumper by Langford completed Unics's comeback, 55-53, soon after that. Another dunk by Williams and a jumper by Langford made it a six-point game, 59-53, in the next-to-last minute. Strelnieks hit a three-pointer, but missed another one to tie the game already in the final seconds. Free throws by Stoll sealed the outcome down the stretch. Both teams return to Turkish Airlines EuroLeague action next week. 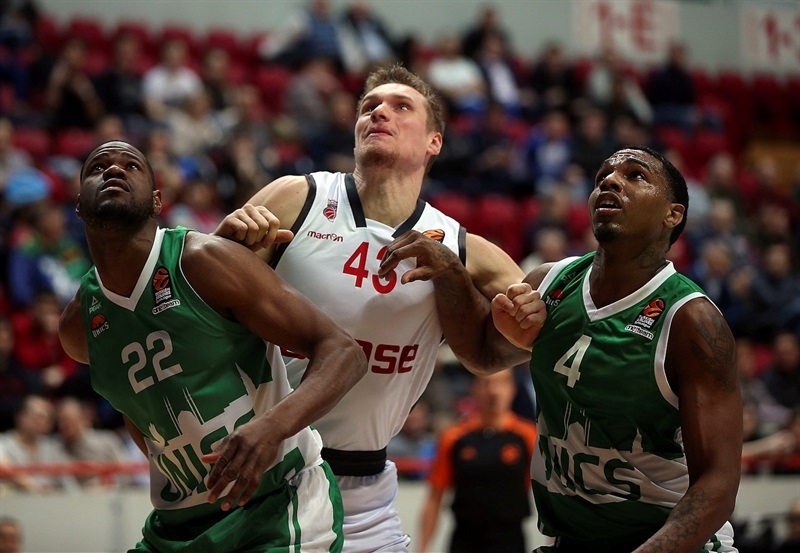 Bamberg visits CSKA Moscow on Thursday while Unics hits the road against Darussafaka Dogus Istanbul on Friday. "I want to thank our fans for the great atmosphere. It was not an easy game because Bamberg just beat Barcelona by 20 points and arrived in good shape, with good rhythm. We expected a tough game, especially after the three losses we had and the injuries of Quino Colom and Evgeny Voronov. Every game, we have a new roster, different players, but my players have a lot of character. Even if some players are injured, we try to be a big team. It doesn't matter; if somebody is injured, somebody else will step up, show character and fight. We were down by 10 but Pasha Antipov and Vadim Panin stepped up and fought, also Latavious Williams and Paul Stoll. They started to fight defensively in the third quarter and started the fourth quarter with a tied score. The most important thing is that they showed the desire and wish to fight for the club, Unics, for their teammates and for themselves. That is the most important thing in life. Tactics are tactics but if you don't have the heart and don't fight, if you don't play with contact, it is very difficult to win. We fought like winners in the third and fourth quarters, were able to stop them and offensively created space and played with patience. We didn't move the ball too much but were smart at spacing and if they went two-on-one against Langford, we found other players to score. He passed the ball well when double-teamed and we were able to win." "I think we tried to find our chemistry defensively, but we were not able to do it until the third quarter. I talked with my players but we kept struggling, making mistakes. Offensively, we played a little bit more outside. In the end, we found the right lineup with Vadim Panin, Pavel Antipov and Latavious Williams, and we were able to stop them. They gave us the effort we needed defensively and we started to play more aggressive, putting Bamberg in trouble. We rebounded better and started to play with more patience on offense, creating more spaces and playing smarter, not turning the ball over. We were down by 10 in the third quarter and it was key to rally and tie the game at the start of the fourth quarter. That changed the momentum of the game. My players found the power and character to play strong defense and, even down by 10, to believe we can win this game." "Congratulations to Unics. They were able to win the game at the end. We played bad the whole game but playing bad, we were up by 12. Our offense was awful tonight. We played without concentration, were not smart in important moments and didn't have any kind of mental presence in the key moments of the game. Melli was not feeling good and played with great effort, but maybe he was not in the right shape to play. Anyway, it was a very, very, very bad game but we could have won even playing bad. Of course, it is always nice to come back here. I only have great memories. There are many teams who could not stop Langford because he is, at this moment, the best or one or one of the best two guards in Europe. If you put together De Colo, Teodosic, Spanoulis and Langford, you can play with four players; the fifth doesn't matter. 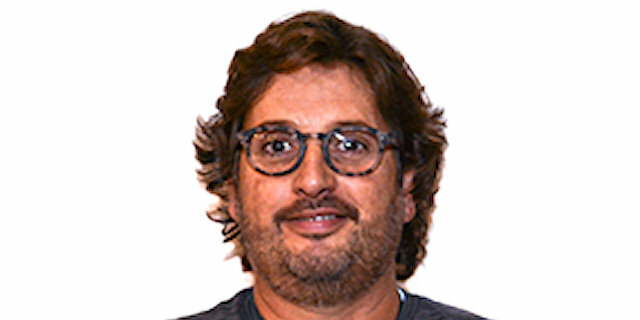 We can put Sergio Llull and get 25 points from all of them! Players are like good bottles of wine: Andrew Goudelock was an excellent young wine and Langford is like a Barolo (very good Italian wine). He has been 11 years in Europe and became so mature and patient, which is very important for a scorer. I saw him first in Europe because Langford played with me as a rookie in 2005. Now he has put together all his journey in a bag of experience and plays like this, making unbelievable shots. He made shots with players on him and we missed open shots, which was the difference in this game." "It is all about the team. We had a bad week last week and heard every negative thing possible about this team. Credit to my teammates and personally, I had a lot of criticism about shooting the ball, but I am going to keep shooting until my damned arm falls off." "I think it was a very bad game from our side. I think we didn't take advantage of an opportunity to win on the road, because I don't think that Unics played a good game, either. It was a bad game for both teams. But you know, when you play on the road, and even playing bad you are up 12 points, I think we could have controlled the game and could have played a little better. This cost us the game, because overall we played a bad game."